I just finished this book. It took me way too long to read. However, I guess I was distracted by a few life situations. At any rate, I am now done reading this book. 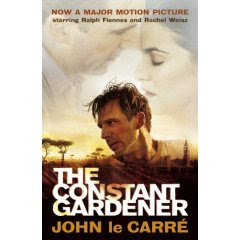 I made a point to read this one before reading The Constant Gardner this month due to the fact that I always seem to miss reading Sky's picks when I delay them. I've seen the movie versions of this book multiple times. (Can anyone say Shirley Temple?) The thing I was most surprised about the book ending was that Sara's father does die. I don't think any of the movie versions have him die. Or, at least, not the ones I've seen. So I was a little taken aback by that. I kept expecting him to pop back into the picture at some point. Sara Crew was kind of an annoying little girl; she was rather too perfect for my liking. I thought the way the "magic" was woven into the story was kinda cute but mostly obnoxious. Sara's thankfulness was misplaced and I guess that's what bothered me the most. "It makes me feel as if someone had hit me," Sara had told Ermengarde once in confidence. "And as if I want to hit them back. I have to remember things quickly to keep from saying something ill-tempered." I could identify with that! Given my history in choosing books for the book club, I'm well aware that I might receive a blogful of stink eyes for this one. But I have to admit that I really liked this book. No, I'll admit that I loved it. Obviously, it's not a perfect book. From the standpoint of traditional literary criticism, it leaves a number of things to be desired. The plot is a little messy and assumes too much of the reader. The shifting point of view, while clever and useful for putting readers right into the action, is also a bit disconcerting and makes the story difficult to follow in places. But ultimately, this is a lovely book because it is--however sad--a lovely story. I have the benefit of having seen (and thoroughly enjoyed) the film that was released in 2005. So, I approached the book with a certain familiarity. I was pleasantly surprised to find, though, that the book is quite a bit different from the movie. At first, I had trouble reconciling the character of Tessa. She comes across as stronger and slightly more abrasive in the book. I loved the character in the film, but I had to warm up to Tessa in the book. Justin, however, was perfect from start to finish. I love that the first part of the story put us more in the minds of Sandy and Gloria and the other characters, leaving us to see Justin through their eyes and to formulate an impression based on that. When we finally get to see Justin up close, it is really fascinating. We realize how little the others knew him and Tessa. We learn that his quiet manner conceals a passionate love for his wife and the son they lost. I love the scene at the end of the book when Sandy comments that Justin has finally "grown up." They all thought he had reached his limit. It just goes to show how careful we must be about categorizing people. Speaking of categories, I know that Tessa is going to be a tough character. She's so determined and reckless (walhalsig?) that it can almost be obnoxious. There were times that I wanted to say, "Just stop! Why are you pushing it?" But people like Tessa make a difference. As Justin points out, she has the kind of integrity that won't let her cross the street without asking if it is ethical. She demands complete ethical purity (and yes, I know I'm treading on thin ice by not classifying "ethics," but I'll go with the book's assumption about this term), and her discovery about the pharmaceutical cover-ups was exactly the kind of unethical activity that would infuriate her. It is assumed that she is a scandalous flirt and that she and Arnold were together. I love that she didn't let other people's opinions bother her, although I'm not sure it was such a great idea to let people think that her husband was a fool. At the same time, I think Tessa was willing to risk her own reputation to protect Arnold, and this is worth considering. Justin knew the truth. That's all that mattered to Tessa. Despite all of the confusing references to drugs and pharmaceutical companies and East African politics (by the way, the quoted articles about drug tests in Britain were real), I think it's important to remember that at its base, this is a love story. It's truly beautiful to see the love between Tessa and Justin unfold in the story. She is so present at all times, even though she is dead. Justin relies on her, turns to her, and takes up her cause. Whether or not you agree with what Tessa is doing, it's hard not to admire Justin for his commitment to his wife. He blames himself for not sharing in her burdens, and he makes the ultimate sacrifice in order to do so. If you have a chance to see the film, I recommend it, because it has a beautiful scene at the end in which they are both at Lake Turkana. She is with him, as she always has been, when he dies. Again, I know that this is a controversial book, largely for its occasional lewd description and frequent use of bad language. Honestly, this didn't bother me, but I know some people won't like it. On behalf of the book club, though, I'm going to recommend this one and say it's definitely worth the time.